Celastrus subspicata ( CELASTRACEAE ).The Caterpillars bore into the bark of the tree to pupate. The pupa is brown and rough, with patches of white and dark brown. Its length is about 1 cm. When disturbed, the pupa emits clicking noises. 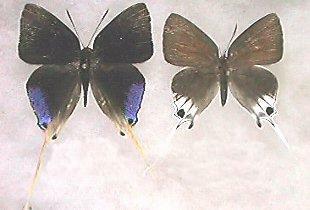 (Photo: courtesy of Yusuke Takanami & Yasuo Seki)The male adult butterflies are black with a blue area on each hindwing. The females are dark brown with a white area on each hindwing. Both sexes have a tail on each hindwing which is as long as the wing itself. 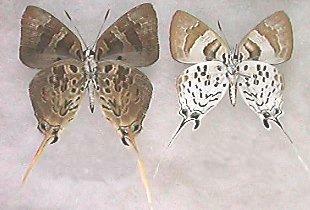 Underneath, both sexes are fawn with broad brown bands under the forewings, and brown dashes under the hindwings. There is a prominent black spot at the base of each tail, both on top and underneath for both sexes. There is another black spot under the base of each hindwing. The wingspan is about 3 cms. The eggs are white, round and flattened. Their diameter is about 0.8 mm. They are laid singly at the base of fruits of a foodplant. The species is found from India to the Solomon Islands, including the Philippines, and including the tropical north-east coast of Australia.